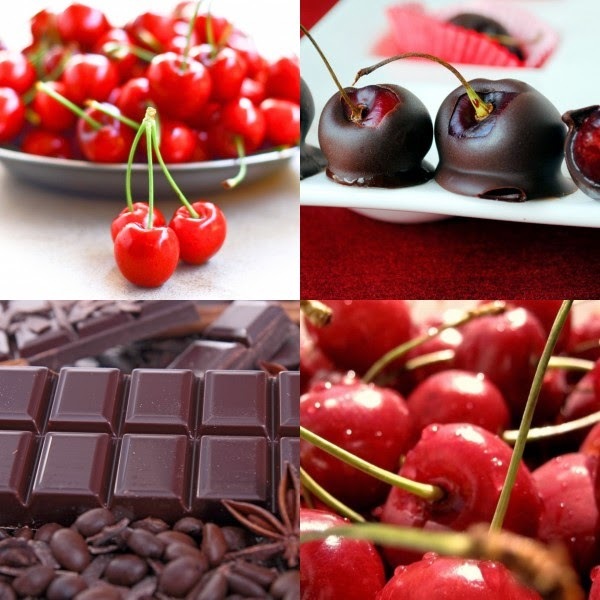 One of my favorite flavor combinations in the entire universe is chocolate and cherries. Chocolate. Followed by cherries. Cherries, followed by chocolate. Chocolate cherry chip ice cream with chocolate chunks. Cherries covered in chocolate. Cherries, dipped in chocolate, and flying through space (I did say the universe). Many moons ago, I received a very important culinary book in my budding, yet illustrious cooking career. 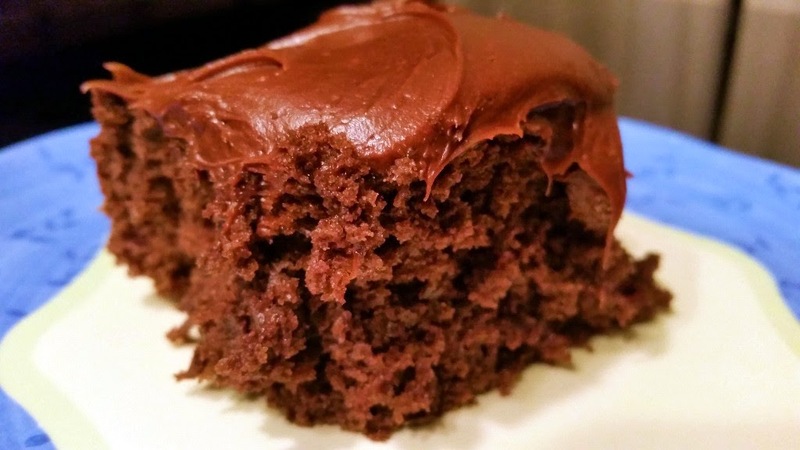 It was authored by Anne Byrn, the Cake Mix Dr., (aka genius), in which she would take regular old boxed cake mixes, add a few extra ingredients, and made them taste like they were homemade. Is she a Doctor? An honorary one perhaps, but in reality, she is a wizard. She takes cake mixes as a base and can turn them into, not only scrumptious cakes, but goes on to defy the laws of cake nature by also turning them into all kinds of concoctions, such as cookies, tortes, bars, brownies, crumbles, dump cakes, it's crazy I say! Crazy like a fox, I mean. Speaking of crazy, try not to lick your screen right now when you feast your eyes on this delectable chocolate covered cherry cake. Anne's original recipe by the way has 2 eggs, and 1 tsp of almond extract - everything else is the same. Also if you noticed, no OIL is needed in this recipe. 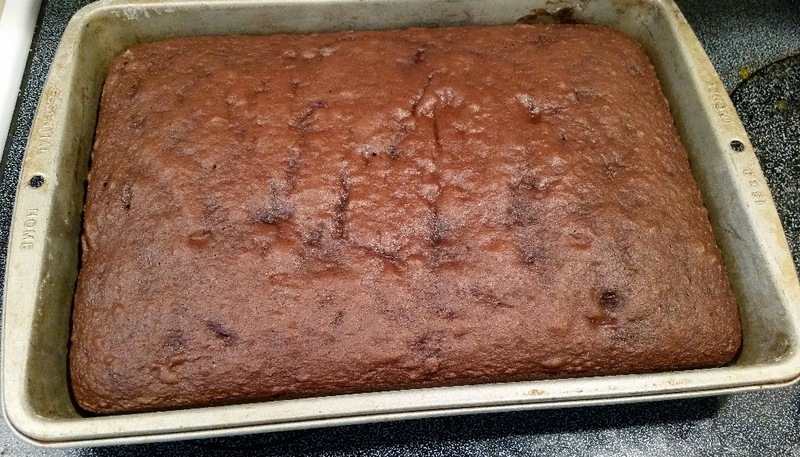 The fruit in the cherry pie filling will add a wonderful amount of moisture into this cake, seriously days later and it will still be moist and tasty and won't dry out. Ha, like it will really last for days, what am I saying? Once you take a bite, you'll be tempted to eat the rest of it straight out of the pan and not share with anyone. So take these said four above ingredients and put them into a bowl. 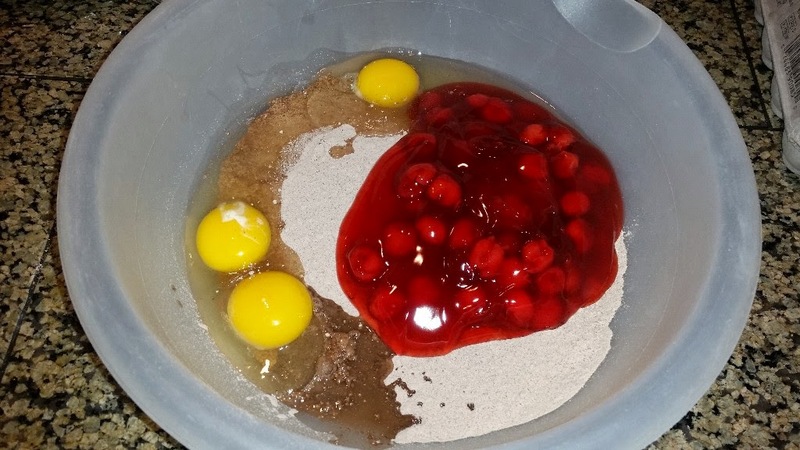 After that mix them with an electric mixer for about 30 seconds, scrape down the sides, then blend for one minute, 30 seconds more. Pour into a prepared (greased and floured) 9x13 pan. Bake according to package instructions, I baked mine at 350º for 34 minutes, until the center was set and a toothpick inserted into the center came out clean... and the house smelled like a chocolate cherry fairyland. Let this cool and then top this bad boy with anything you wish. 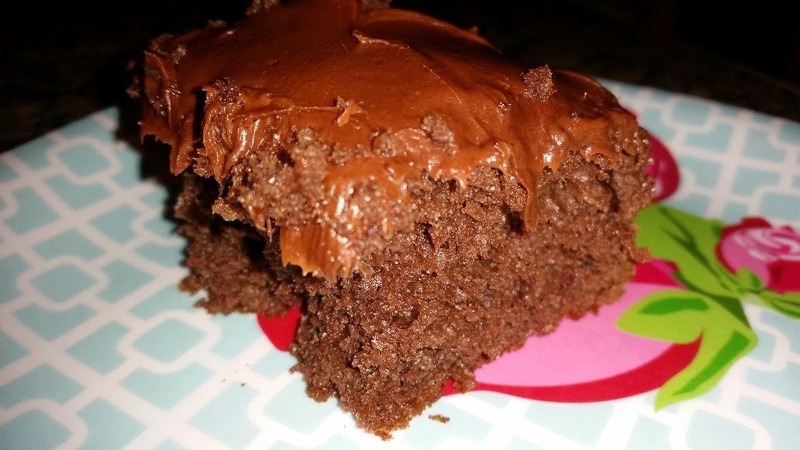 A dollop of homemade whipped cream, your own homemade butter cream, or a any store bought variety of chocolate frosting. Wait, I'm having an epiphony, warmed up cherry sauce (Note to self: going to try that next time)! 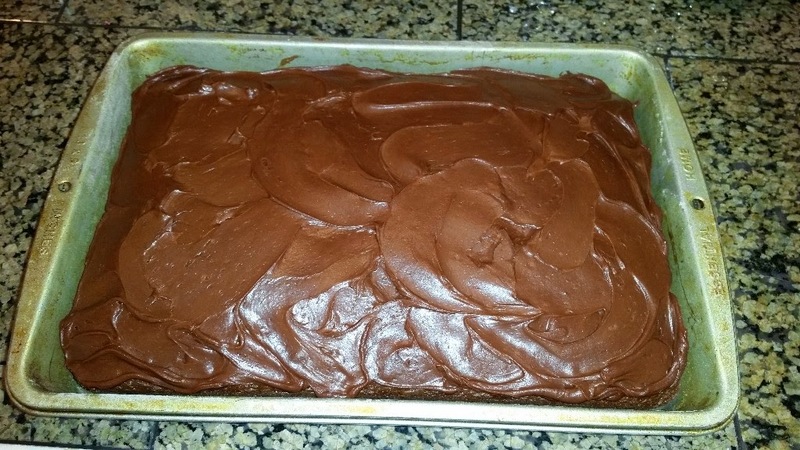 At the time of this particular baking, I was having a major chocolate craving, coupled with a clash of down right laziness, so I went for the Betty Crocker Homestyle butter cream frosting in the tub. Slather that puppy on the top and take a deep whiff of all that chocolate cherry goodness. Sorry for the boring 9x13 pan. This is week night cake, we don't have to look pretty, we just have to taste good. Time yourself and see how long you can wait before you slice yourself a piece. Don't forget to put some on your fork. You can push your fork through this entire piece of cake and the whole section will stick to the tines. Anyway, this cake is so awesome. The double hit of almond extract really brings out a nice cherry flavor that is not overpowered by all that chocolate. This is a great go to cake to bring to parties, potlucks, and family gatherings. 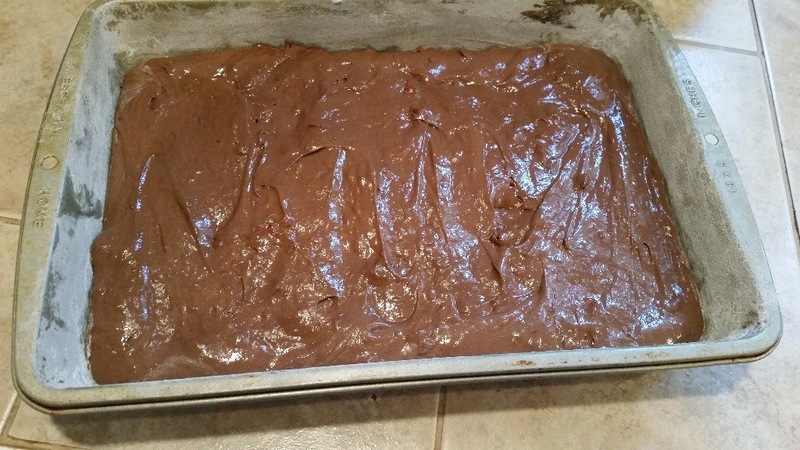 The batter also makes for nice, rich, people will be asking for more of them plus the recipe cupcakes. 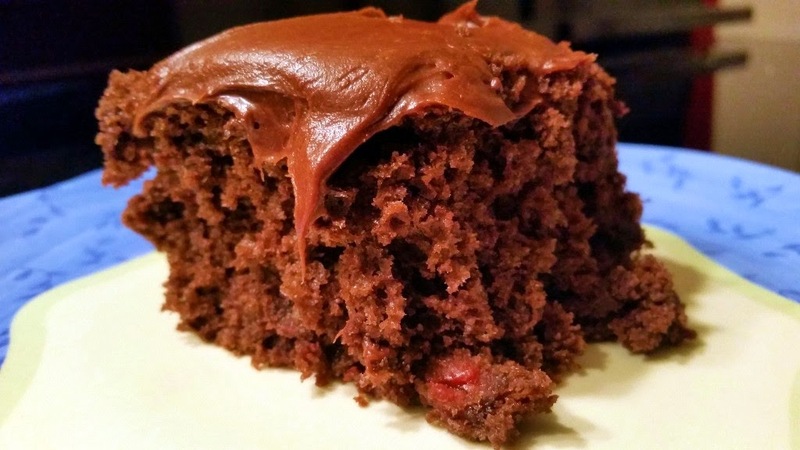 The 4 ingredient chocolate covered cherry cake - easy and delicious! 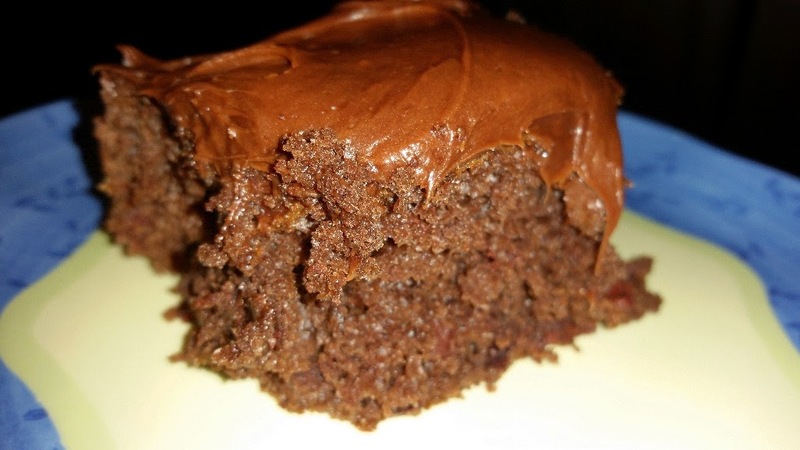 The best part about this four ingredient recipe, is that you can do different cans of pie filling and different flavors of cake, for an almost unlimited combination of flavors. I have made an apple spice cake in this same fashion (click here) with a cinnamon glaze that is to die for! I still want to try different fruits with the bases and see what I can come up with. For now, I will bask in this super awesome chocolate cherry goodness, and know that it was GOOD! Nay, Delicious. 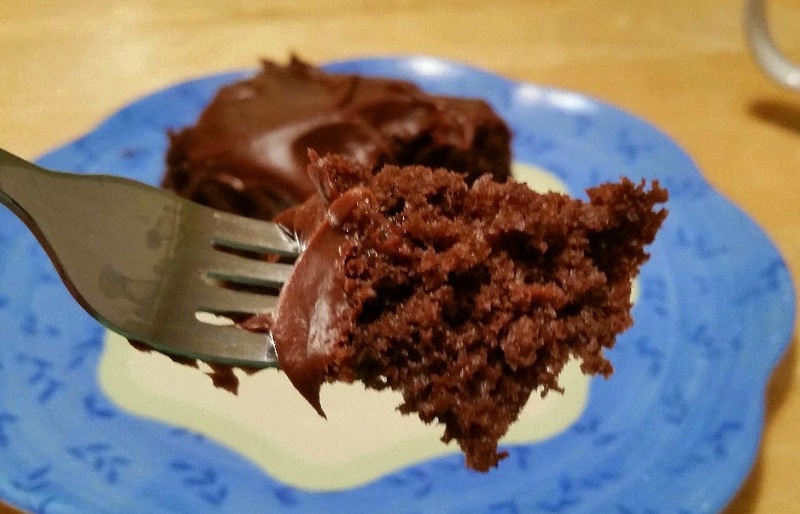 I like fast , yummy, 4 ingredient cakes!!! They are the best!